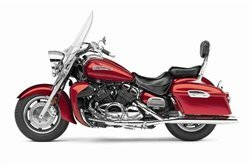 The best of two worlds: Stripped-down street cruisability and plush long-distance touring capability in one motorcycle. Quick-detachable windshield and backrest let the rider optimize the bike for cross-town cruising cool or cross-country touring comfort quickly without tools. Electronic cruise control with right handlebar controls for ease of use. Color-matched locking hard-shell sidebags with handy, one-touch openers and spacious 9.3-gallon storage with interior storage pouch. 67.5-inch wheelbase provides a smooth highway ride and plenty of room for rider and passenger. The Royal Star Tour Deluxe S gets chrome accents to the front end. The Royal Star Tour Deluxe achieves fuel economy up to an estimated 42 mpg** with a fuel tank that holds 5.3 gallons of gas. 79-cubic-inch (1294cc) liquid-cooled, DOHC 70-degree V-four tuned to put out class-leading power—97hp @ 6000 rpm and maximum torque at 89 ft.-lb. @ 4750 rpm—for incomparable cruising performance. Four heated Mikuni 32mm carburetors with TPS deliver seamless throttle response and greater power across the entire rev range in nearly any climate. Compact-design dual intake system enhances performance without sacrificing fuel tank capacity. Large-capacity radiator ensures superior engine cooling for maximum efficiency. Single-axis internal counterbalancer reduces engine vibration for super-smooth running. Wide-ratio five-speed transmission with 4th and 5th gear overdrive provides plenty of highway passing power as well as low-rpm, fuel-efficient cruising. Low-maintenance hydraulic clutch actuation and strong, low-maintenance shaft drive for touring convenience. High-integrity, single-backbone frame with solid engine mounting and 29-degree caster angle delivers responsive steering and excellent handling. Air-adjustable telescopic front fork with 5.5 inches of travel smoothes out the bumps and adapts to varying load capacities. Air-adjustable link-type rear suspension features a vertically mounted single shock with revised damping for a classic hardtail look and outstanding long-distance ride quality. Large-diameter front and rear disc brakes with sintered pads provide strong, linear stopping power. Rider and passenger seats provide room and comfort along with a low seat height 29.1 inches. Full-sized, floating-type rider and passenger floorboards reduce vibration and are positioned for optimal long-distance comfort. Quick-detachable windshield and backrest are standard equipment on the Tour Deluxe, letting the rider optimize the bike for cross-town cruising or cross-country touring - without tools. Cool retro “dash” combines classic looks with new-age function, including: digital speedometer, odometer, dual tripmeters, fuel tripmeter, clock, fuel gauge and indicator lights for cruise control, overdrive, neutral, high beam, turn signals, water temperature and low oil-level. Wide hand control levers offer great feel and look cool too. 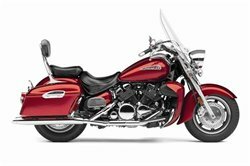 5.3-gallon fuel tank provides outstanding touring range along with classic lines. Incomparable fit and finish includes flawless paint with extensive chrome and brushed stainless steel accents as well as deep, valanced steel fenders. Large, powerful 12V 60/55-watt halogen headlight in stylish chrome shell with custom bezel maximizes nighttime visibility while cutting a stylish profile. Ignition switch with integrated steering lock mounted near the front of the fuel tank for extra convenience. 12V 18AH maintenance-free battery for reliable starting even in cold weather.